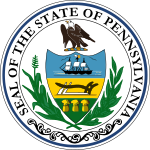 The Pennsylvania gubernatorial election of 1841 was between two candidates. Incumbent Governor David R. Porter ran for the Democratic Party, and defeated John Banks. ^ Miller, Herman P; Baker, W. Harry, eds. (1911). Smull's Legislative Handbook and Manual of the State of Pennsylvania. Harrisburg: State of Pennsylvania. p. 542.